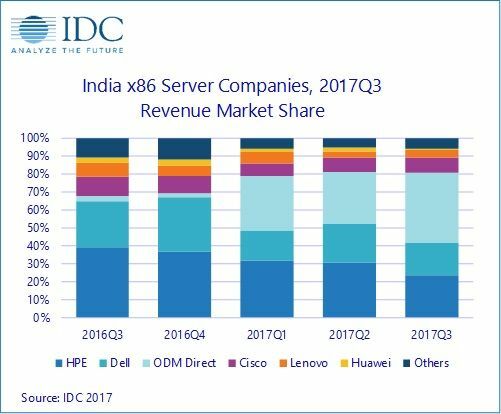 BANGALORE, 21st DECEMBER 2017 - The overall server market in India witnessed a year-over-year (YOY) growth of 51.1 percent in terms of revenue to reach $300.83 million in Q3 2017 versus $199.05 million in Q3 2016, according to the latest IDC Asia/Pacific Quarterly Server Tracker, Q3 2017. The x86 server market continues to grow accounting for 89.7 percent of the overall server revenue by product category. The growth primarily resulted from the expansion of Data Center’s(DC’s) and increase spending from public cloud players, during Q3 2017. The other reason for the growth of x86 platform can be strongly co-related to the fact that linux is becoming the OS of choice for enterprises running new age workloads. ODM players who are strategically targeting the new buyer segment like third party DC and public cloud service providers have successfully reached revenues of $105.0 million at end Q3 2017. As a result, the x86 server market have grown YoY by 64.3 percent to reach $269.9 million during Q3 2017. The key verticals that witnessed growth were professional services accounting for 61.4 percent of market share, followed by manufacturing with market share of 11.9 percent, in terms of revenues. At the form factor level, rack and blade together accounted for 81.9 percent of overall server market by revenue. Rack servers were preferred by end-users who are looking for excellent application performance at low cost. Blade servers grew with an YoY growth of 9.2 percent in terms of revenues; professional services and manufacturing verticals had shown increased adoption towards blade servers, while telecommunication vertical witnessed a marginal increase in contribution towards blade revenues. The non-x86 market declined annually by 11.2 percent to reach $30.95 million in Q3 2017, major contribution for this product category came from banking accounting for 76.2 percent of the revenue share, followed by government, manufacturing, retail and telecommunications vertical. Some of the banking deals were purely refresh, while others were focused towards supporting the new payment modes. In terms of revenue, IBM came back strongly accounting for 59.8 percent of market share, followed by HPE with the share of 25.6 percent during Q3 2017. HPE continues to dominate the x86 Server market with the share of 23.9 percent in terms of revenue, followed by Dell with revenue share of 18.0 percent and Cisco contributing for 8.6 percent of revenue share, during Q3 2017.The major deals for HPE came from professional services and manufacturing verticals. ODM direct accelerated growth continues with high dependence on major public cloud service providers spending in India. "Professional services, manufacturing, and BFSI are the next growth verticals, so positioning vertical focused strategies and programs specific to partner would yield good results for vendors,” says Harshal Udatewar, Server Market Analyst, IDC India. Indian end-users are slowly evaluating and migrating their non-mission critical workloads on private/public cloud and thus hybrid cloud adoption can be seen in majority of the enterprises. Amongst few advanced tech- enterprise segment, multi-cloud strategies are also being noticed; this is good news for enterprise infra market from compute point of view. Professional service continues to be the leading vertical with increased spends on hardware (server) followed by manufacturing vertical. We are noticing electronic manufacturing clusters getting set-up across various zones in India that is expected to drive server growth. Telecommunication Industry focusses on improving customer experience management and positive Government initiatives are expected to provide strong signal for growth of compute requirement in India.